This is an acrylic slatwall shelf with a deep lip to hold your items in place. The clear design will make your products stand out and look their best. The acrylic used in the construction of these slatwall shelves is of the highest quality to ensure the maximum durability. With a simple design you will not have to worry about this item fitting in with your current space. Brackets are available for gridwall as well. Back wall height is 4.75"
An open-end book shelf constructed of clear acrylic. Shelves are sturdily designed, ideal for books, art or other slender merchandise. Measures 23 3/4"w x 4"d x 3"h. For gridwall use only. 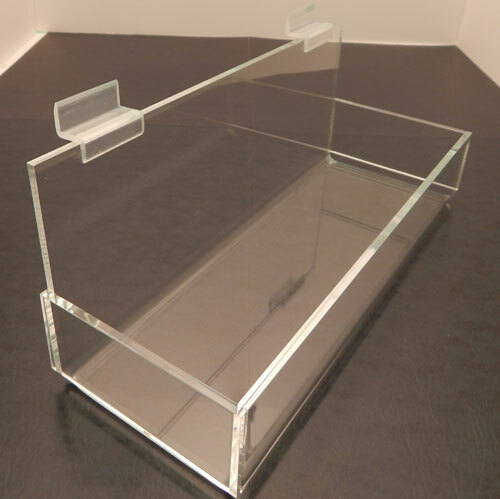 This large gridwall shelf is constructed of clear, heavy-duty acrylic. 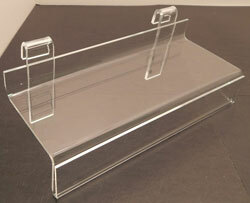 Strong construction allows you to display a variety of heavier merchandise on this acrylic shelf. It measures 24"w x 8"d.
Wide acrylic shelves for gridwall display. Mounts easily to your existing display and can be placed end to end for a continuous display area. Shelves do not have a lip. Available in 4 sizes.